In the Fortean Times Dr Karl Shurker cites correspondence with Ben Willis of Scottish Big Cats concerning cats in North Carolina, USA, which had similar features to Kellas cats. Ben Willis pointsed out that these cats were "considerably larger than a domestic, with white guard hairs, a kinked tail, and extraordinarily large canine teeth." and that one had "a small white star on his chest". Ben Willis and Karl Shuker both note that these are features found in Kellas cats and Dr Shuker suggests "The existence of such creatures in an area bereft of Scottish wildcats indicates that the Kellas cat's distinctive features may owe more to its domestic (as opposed to its Scottish wildcat) ancestors than previously supposed." My own observations would support Dr Shuker's hypothesis. In September 2003, I encountered a large, fully mature black female cat which could hardly move, having just eaten a whole adult woodpigeon. 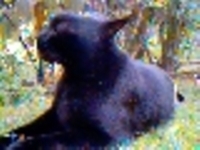 This cat, like the Kellas cats and Ben's cats in North Carolina, was extremely large, had white guard hairs, very large canines (and extremely large paws and claws) and also had a white marking on its chest (See photo). However, it seemed extremely unlikely that this cat had any wildcat or Kellas cat ancestry as it was encountered in South-east Scotland, in an area where the wildcat became extinct before 1800. The cat was quite obviously extremely tame and well domesticated. These observations would support the suggestion that features initially thought to be typical of Kellas cats such as large size, white guard hairs, large canine teeth, and white markings on the chest are found in domestic cats.